If you venture into the backcountry, please take into consideration the very real possibility of getting lost. 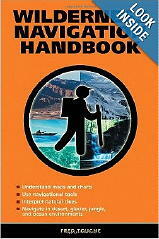 Please endeavor to "Stay Found" by educating yourself and your loved ones on the skills of backcountry navigation. Whether hiking (with map and compass hopefully) or enjoying recreational orienteering with map, compass and GPS, you will need at least some basic skills before ever journeying into a wilderness area. Listed below are popular and proven books selected for this purpose. Get Out in It ! The seasons are for our enjoyment ! Visit the Backcountry Health & Safety discussion forum.